For the metro station in Shanghai, see Disney Resort station. Disneyland Resort (Chinese: 迪士尼) is a station on the Hong Kong MTR Disneyland Resort Line. It was built to serve the Hong Kong Disneyland Resort, and is located in Penny's Bay. The station is designed in a Victorian style, with spacious open areas. It has also been designed with a Disney theme in mind to match the décor of the park. It opened for public use on 1 August 2005, in preparation for the opening of Hong Kong Disneyland Resort, which opened on 12 September 2005. Architecture firm Aedas was the architect for the Disneyland Resort Line and, consequently, for the Sunny Bay and Disneyland Resort stations. 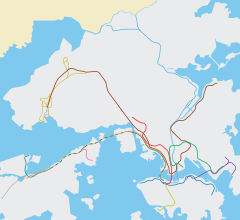 This station is the second to have only one platform, after Po Lam Station on the Tseung Kwan O Line. The platform is equipped with automatic platform gates to prevent passengers from accidentally falling onto the track. This kind of gate was the first of its kind to be introduced in Hong Kong. As of 2015, the current automatic platform gates are as long as a four-car train and can be extended in the future to accommodate a train length of up to eight cars. There is only one exit at this station. There is a bus interchange at Hong Kong Disneyland Resort. R8 parallels the Disneyland Resort Line. Routes R33 and R42 operate only on Sundays and public holidays. Wikimedia Commons has media related to Disneyland Resort Station. ^ "HKIA (Merit), Green Building Award". HKTDC Research. ^ "Disneyland Resort Station street map" (PDF). MTR Corporation. Retrieved 27 March 2015.